Hakusan, Japan, November 18, 2014 – EIZO Corporation (TSE: 6737) today announced the release of the ColorEdge CG318-4K, a 31-inch monitor with a DCI (Digital Cinema Initiatives) 4K (4096 x 2160) native resolution. The ColorEdge CG318-4K is designed for media & entertainment fields like cinema and broadcasting that are employing increasingly high-resolution formats and require appropriate display solutions for 2D and 3D CGI (computer-generated imagery), visual effects, compositing, and color grading. It can be used for both editing and reference work. It is also ideal for professionals in photography and printing requiring a monitor with a high resolution and pixel density. The ColorEdge CG318-4K comes with a built-in sensor to enable self-calibration for hassle-free monitor maintenance. EIZO offers two dedicated calibration software programs, ColorNavigator NX and ColorNavigator 6, that lets users set target values for brightness, gamma, and white point and generate an ICC profile. ColorNavigator 6 comes bundled with the monitor and is for individual users that require additional functionality such as manually adjusting the properties of a calibrated monitor. ColorNavigator NX is available as a free download from eizoglobal.com and is for organizations the want to centralize quality control of their monitors. For color management of the ColorEdge CG318-4K and select other ColorEdge monitors on a network, EIZO also offers ColorNavigator Network, a secure, cloud-based web hosting solution for administrators to perform quality control (QC) tasks on client ColorEdge monitors with ColorNavigator NX installed. Used together, ColorNavigator Network and ColorNavigator NX allow an administrator to take advantage of the self-calibration capabilities of the ColorEdge monitors by automating calibration and other QC tasks on ColorEdge monitors located in a single or multiple locations. This potentially saves hundreds or thousands of hours annually in maintenance downtime while ensuring the color accuracy of all ColorEdge monitors. The ColorEdge CG318-4K uses an LED-backlit IPS (in-plane switching) LCD panel with a wide color gamut that reproduces 98% of the DCI-P3 and 99% of the Adobe RGB color space. Viewing angles are 178° and the maximum brightness is 350 cd/m2. Dark tones retain their depth with a 1500:1 contrast ratio even when viewing the screen from an angle. The ColorEdge CG318-4K comes with a sleek new cabinet design that blends well with a working environment. It is as practical as it is aesthetically pleasing with LED backlit buttons for dimly-lit studios, a carrying handle and cable holder on the back, and three USB downstream ports on the side. It also has an ergonomic stand with 149 mm height adjustment, 40° tilt (-5° – 35°), and 344° swivel. Two DisplayPort (ver. 1.2) and two HDMI connectors are included. The DisplayPort connectors support the native 4096 x 2160 resolution at 60 Hz and the HDMI connectors at 30 Hz. For video editing and post production, the ColorEdge CG318-4K has a 3D LUT (look-up table) that adjusts color individually on an RGB cubic table. With ColorNavigator NX’s film emulation function, the 3D LUT applies a film look to the image so creators can preview how the image will be seen by their audience. For brightness and color uniformity, EIZO uses its own Digital Uniformity Equalizer (DUE) technology. DUE ensures a Delta-E difference of three or less across the screen. It also counterbalances the influences that a fluctuating ambient temperature may have on color temperature and brightness. Factory-calibrated to ensure color uniformity between all units. 10-bit display1 (more than one billion colors simultaneously) from a 16-bit look-up table via the DisplayPort inputs. Seven preset modes: DCI, EBU, Rec.709, SMPTE-C, Adobe RGB, sRGB, and CAL. Brightness modulation technology to minimize flickering and eye fatigue. Shading hood included to minimize ambient light reflecting off the screen. 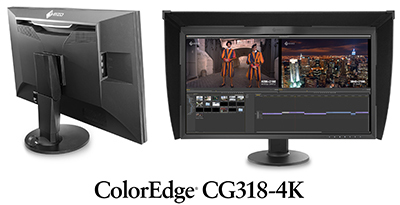 The ColorEdge CG318-4K will begin shipping in April 2015. Date of availability will vary by country. ColorNavigator Network is currently available. Please contact the EIZO subsidiary or distributor in your country for details about both products. EIZO (TSE:6737), which means image in Japanese, is a visual technology company that develops and manufactures high-end display solutions. EIZO integrates hardware and software technologies with consulting, web hosting, and other services to help customers in business, graphics, gaming, medicine, maritime, and other fields work more comfortably, efficiently, and creatively. Headquartered in Hakusan, Japan, EIZO has R&D and manufacturing facilities in Japan, China, Germany, and the US, and representation in more than 70 countries. For more information, please visit www.eizoglobal.com. 1 A graphics board and software which support 10-bit output are also necessary for 10-bit display. 2 The usage time is limited to 30,000 hours. Must be used within the recommended brightness off 120 cd/m2 or less and the color temperature between 5000 – 6500K.